Here’s a 1969 video of Buddy Guy performing My Time After A While, with Jack Bruce on bass and Buddy Miles on drums. The studio version is on the I Was Walking Through The Woods album. Here’s a 1974 video of Buddy Guy and Junior Wells performing Ten Years Ago at the Montreux Festival. The studio version is on the I Was Walking Through The Woods album. 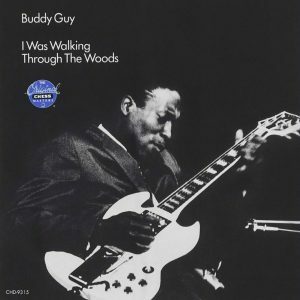 Album cover, I Was Walking Through The Woods, by Buddy Guy. Released in 1970 on Chess Records.